Concrete Equipment From Dynamic Concrete Pumping, Inc. 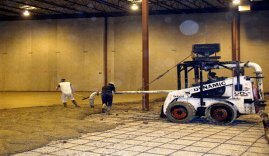 Dynamic Concrete Pumping Inc. has a combined experience of over 35 years. Dynamic Concrete was the first in Western Canada to utilize a hardener spreader. A Bobcat skid steer fitted with a concrete placing attachment is capable of placing concrete up to 100-meters per hour. When you’re looking for a partner capable of meeting your diverse concrete pumping equipment needs, Dynamic has you covered. 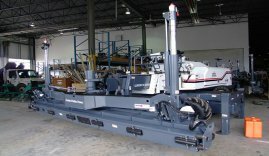 Our extensive fleet includes a broad range of top-quality machines and tools built by industry-leading manufacturers. Whether you are a commercial contractor, residential builder or any other company that needs equipment for pumping, pouring, placing or finishing concrete slabs, we’re sure to have a solution that fits your budget and your project requirements. Dynamic Concrete is a comprehensive source of concrete pumping equipment in Calgary, Edmonton and across Western Canada. We call on over 40 years of experience to ensure we have the machines you need to maximize productivity and increase your bottom line. When you have a commercial pumping job to complete it’s important to have an industry leading concrete pumping company there to assist you, and Dynamic Concrete Pumping is here to provide the support you need to get the job done right. Concrete Pumping Equipment: We offer concrete boom pumps from 33-meter to 57-meter units capable of a variety of jobs and environments. You’ll find solutions for everything from transporting concrete to high-rise buildings to working in and around job site obstacles. We also provide truck-mounted line pumps ideal for applications that are difficult to reach with an extended boom. 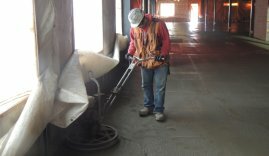 Finishing Equipment: Our concrete finishing equipment includes walk-behind and ride-on trowels. We carry a variety of sizes and configurations to ensure fast and efficient finishing with quality results. 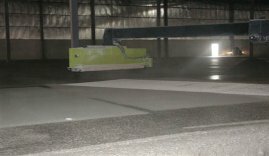 Laser Screed: Dynamic provides advanced laser screed technology with time-saving auto stabilizers and ergonomic joystick steering. These sophisticated yet easy-to-use units allow the operator to adjust the boom travel and rotation rates and head rotation speed for precision control on every job. Hardener Spreader: We are pioneers in using hardener spreaders in Western Canada. These innovative machines are capable of evenly spreading up to 100 pounds per square foot with no dust or messy clean up required. Bobcat Placer: The Bobcat skid steer fitted with a concrete placing attachment is capable of placing concrete up to 100-meters per hour. The compact frame provides optimal mobility for pouring concrete in difficult-to-reach locations. 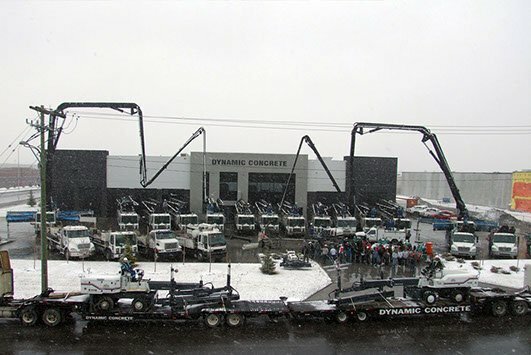 Dynamic Concrete is proud to be the leading source for concrete pumping equipment in Edmonton, Calgary and beyond. Give us a call or submit our online form to request to speak with a representative about your projects today.